Last week I attended my first NSF ATE PI meeting. As a contributing member of Digital World Biology's ATE project entitled " A Bridge to Bio-Link's Future ," I participated in the conference by preparing and staffing our booth in the first evening's showcase. 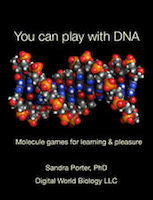 Play with DNA! DNA games and more!